Guests of Perrier-Jouët including Deborah Symonds & Ned O’Neil, Eva Galambos & Michael Penny, Jonathon Pease & Maddison McKay, Kelvin Ho & Jacqueline Perrett, Dina Broadhurst and Jason Grant gathered at Marks Park, Bondi, to celebrate the brands inaugural partnership with the Sculpture by the Sea festival. 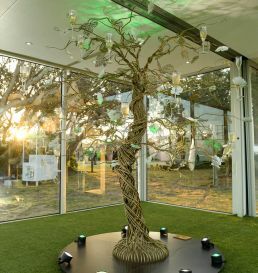 The centre piece at Marks Park was the stunning Perrier-Jouët Enchanting Tree, which features as an official sculpture as part of this years’ exhibition. 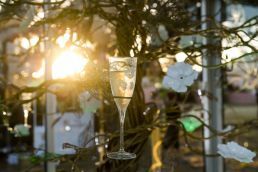 Guests were able to pluck champagne flutes from the branches of The Enchanting Tree enjoying champagne, canapes and a toast by Sculpture by the Sea founder, David Handley AM to officially announce the partnership. As the sun set, guests enjoyed a private twilight tour of the exhibition by artist Harrie Fasher, winding down the Bondi Headland. 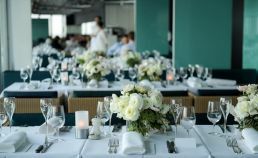 Upon conclusion of the tour, guests arrived at the iconic Icebergs Dining Room and Bar where bottomless flutes of Perrier-Jouët Belle Epoque flowed. Head Chef Monty Koludrovi created a bespoke three course menu for the evening, paired to the flavours of Perrier-Jouët Grand Brut, Belle Epoque Blanc 2007, Belle Epoque Rose 2006, and Blason Rose with dessert.